Cambridgeshire 4 piece Velvet Woods release their self titled debut LP today and it's an impressive first full-length record. On the same day that Mancunian Jim Noir releases his 60s homage Finnish Line Album, another finely crafted LP from the same era is released by relative newcomers Violet Woods. This time, we have a Byrdsian/Spector affair. Like the Noir album, this one is beautifully produced and full of well crafted pop songs. Electric Fascination gets the album underway and it sounds like a real opening album track. A good introduction to the band with a simple, repetitive guitar line dominating the song. Over The Ground has a touch of Joy Division's Digital about it. Next up is Here, the standout track for me, and it shifts the album up a gear. A well crafted, upbeat, timeless pop song with a great guitar solo for good measure. The Dancer, with its Moog and funky bass is more reminiscent of Stereolab and Pulp, showing that Violet Woods are a versatile beat combo. Take Your Time is a near seven minute epic and almost as good as anything in the Ride back catalogue. What I Need is a departure, with a spoken word vocal which doesn't work for me. Raw Love is a return to form and is a perfect piece of fuzzy garage pop. 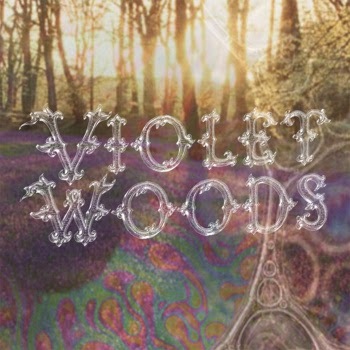 An impressive debut from Violet Woods and on the strength of this album, a band I hope I am able to check out live soon. The album is out on a limited edition vinyl run of 200, a letter-pressed cd and download from their Bandcamp site. They play a launch gig at the Portland Arms in Cambridge on November 7.